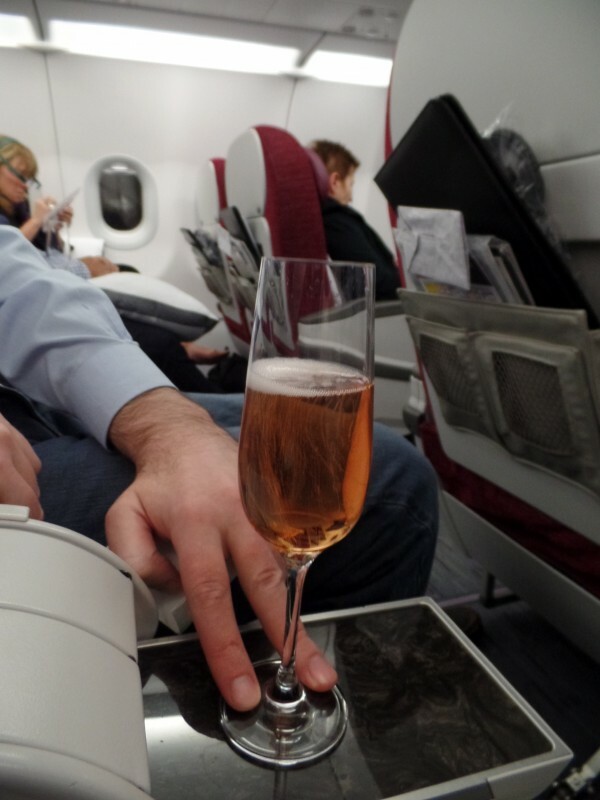 In all fairness – we flew in premium cabins the entire itinerary, but really the core stress point was the originally planned 90 minute turnaround in Cairo. Of course, there were more stress points. I thought it might be interesting to use those as a way to offer the highlights of our international mileage run. First stress point: was self-induced. We got out of the house a couple minutes later than anticipated, about 8 minutes into the drive to the airport, ADT called to tell us there was an alarm at the house. Being so close, I decided to turn around and investigate for myself. It turned out to be a false alarm, one of many I’ve had with ADT. That delayed us in total just under a half hour. 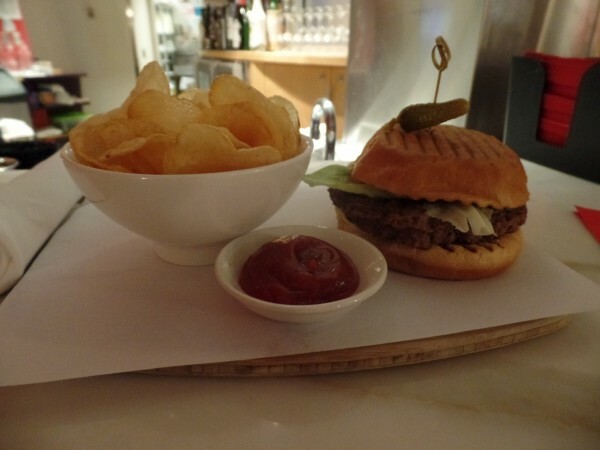 We still made it to the airport in time, even having enough time to grab a burger in the Virgin Atlantic lounge. Brief comment about that: It screams irony that Qatar Airways partners with Virgin Atlantic for the use of their lounge at Washington-Dulles. This even though British Airways (competitor to Virgin Atlantic) is a fellow OneWorld member. Add to it that Qatar Airways recently bought a 10% stake in IAG, the company that owns British Airways. 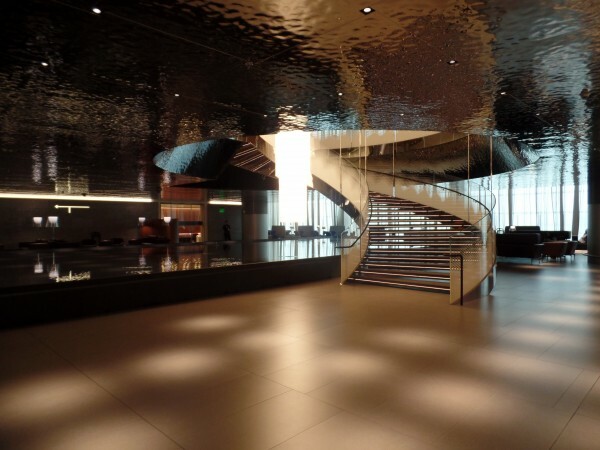 All said, Virgin Atlantic’s lounge was our second favorite at Dulles, but a very close second to Etihad’s lounge. Server service, a la carte (aka you order what you want, but still gratis) menu. Second stress point: was trying to get boarding passes for our flights ex-Cairo, which, was on a separate itinerary. 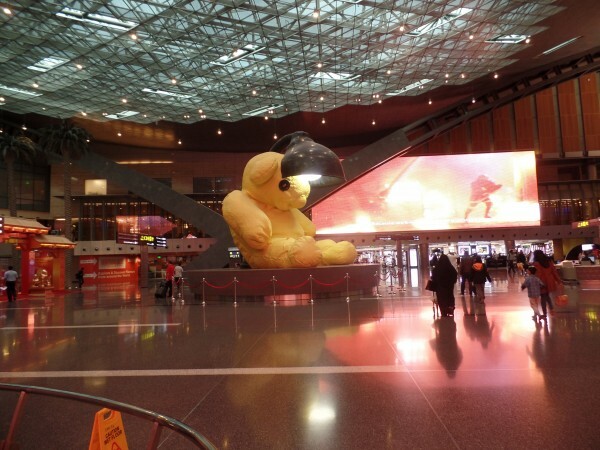 When we landed in Doha, we figured that the lounge had a cadre of folks that could help, so we skipped the transfer desk, went through “transfer security” and made a bee-line for the lounge (after a picture of the big yellow teddy bear). Big mistake: The staff in the lounge was unable to help, and advised that we go to the transfer desk. So we grabbed a bite to eat in the lounge, and made our way back down. It’s a lot harder leaving the “security zone” than entering. To leave (aka get to the transfer desk) we were directed to an unused security checkpoint, but when we started walking through and we were told to turn around. We did as told and were met by a large woman, as well as a guy in a uniform, telling us to go back (the way we were trying to go), so we could “re-enter” via one of the operational security checkpoints, we complied. Once “out” of the security zone, we went to the transfer desk, who was surprisingly efficient in providing our boarding passes. Then it was back through security, which, again, was easier getting in, than out. Third stress point: This was the key stress point leading up to the trip – the 90 80 minute turnaround. In reality, the turnaround was supposed to be 105 minutes, but I handicapped it to 90 minutes because I wanted to be safe. 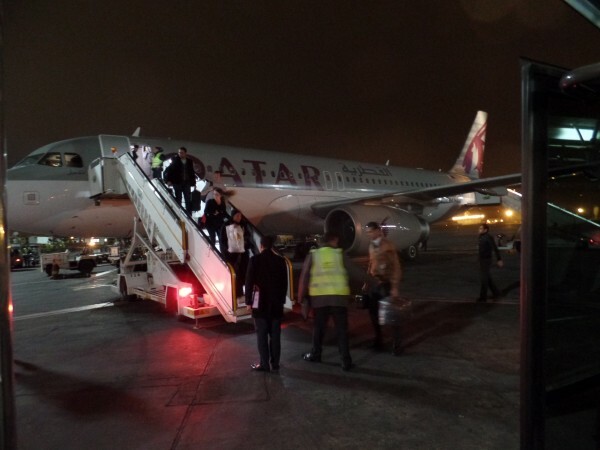 It turned out that we left Doha late, then in Cairo we taxied forever—heck, we might’ve landed in Alexandria and taxied to Cairo! 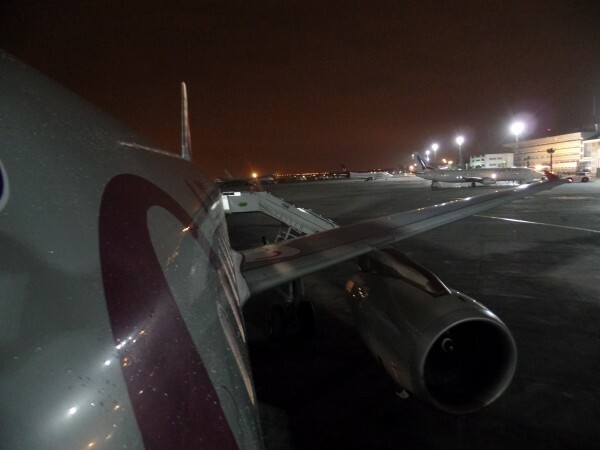 When we finally got off the plane, it was 80 minutes before our scheduled departure. Departing the plane that we were trying to make in just 80 minutes! We hustled down the stairs (Cairo uses remote gates, unless you’re flying Star Alliance), onto the bus, and waited impatiently for the ground staff to release the bus. Luckily the first bus is reserved just for First Class, and left as soon as all first class passengers were on board. Cairo Immigration Officer: Where did you just fly from? Cairo Immigration Officer: Where are you flying to? Cairo Immigration Officer: Ok, where did you just fly from? Cairo Immigration Officer: But your boarding pass says you’re flying Cairo to Doha. 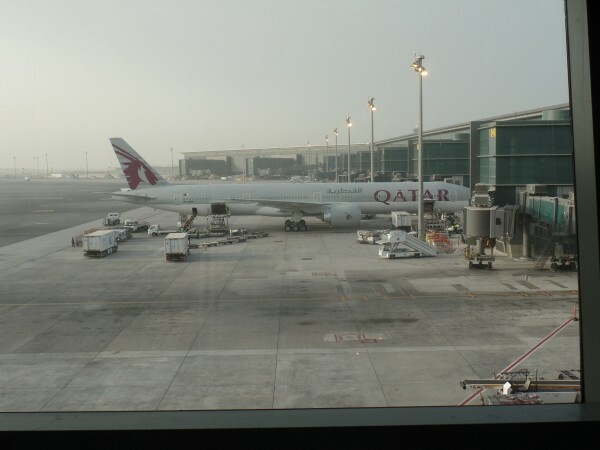 Cairo Immigration Officer: Why are you flying to Doha if you just came from there? Me: We’re on a mileage run. A couple minutes later, another gentleman came, took our passports from the Immigration officer, and said he’d return in 5 minutes. He disappeared into the terminal, and a colleague of his returned about 4 minutes later. He asked if we’d like to go to the lounge, to which my response was that we would much appreciate it. As he walked over to fill out some paperwork with the immigration officer, he asked if my wife was pregnant. That one threw me for a loop. Had I been anywhere else, I would’ve responded: “Would that make this process faster?” instead I said no (the honest answer—no surprises here), and he just nodded. A few more minutes of waiting, he returned to us and escorted us to the VIP lounge. And when I say VIP lounge, I mean the only lounge in the airport. Imagine unsecured wifi, a bunch of seating, food that you probably wouldn’t want to eat, and plenty of non-alcoholic beverages. Oh and smoking in Cairo airport general seems to be fully permitted. I wasn’t complaining. Heck, I almost wanted to hug the guy, until he said he had to take our passports to check us in. Be back in 10 minutes he says. When the gentleman re-appeared, roughly 11 minutes after he disappeared—and I’ll give him the benefit of the doubt here, because he was waiting for the elevator a good 60 seconds just to get down—and now I thought my wife was going to give him a hug. We finally had our passports. He directed us to the gate, and casually escorted us to the gate. In fact, he talked a different immigration officer through waving us by to get onto the bus back to our plane. After having a celebratory glass of rose champagne, I considered the mileage run a success. But we still had another flight to go, with a winter storm warning back home. 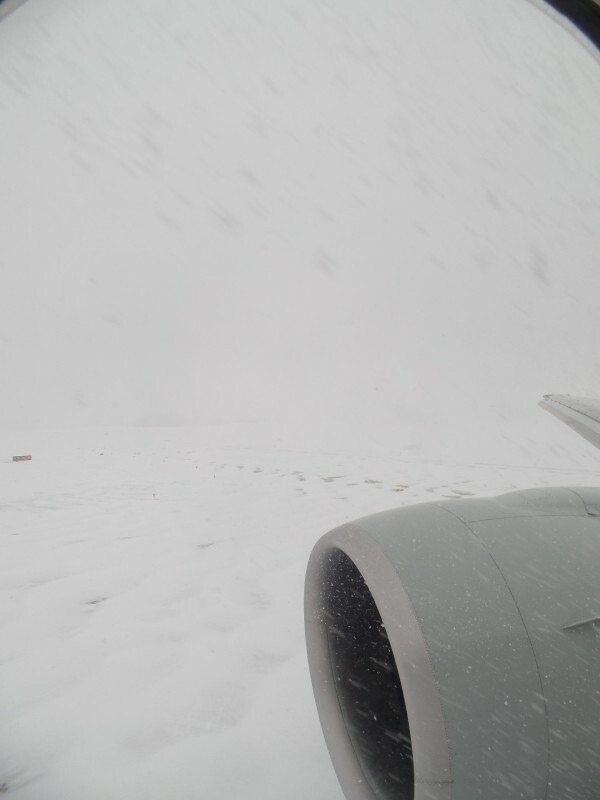 Fourth stress point: Despite headwinds, and probably not departing Doha on time, we landed on time, on a rather snowy runway. 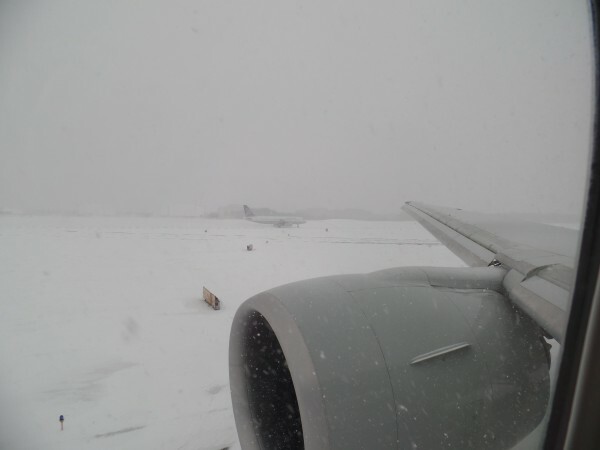 Is this Washington-Dulles or did we mistakenly land in the Arctic?!? Maybe another plane got lost and landed in the Arctic? Or maybe we really are at Washington-Dulles! I don’t want to belabor the point – but slow and steady wins the race. Even if you’re driving a Mini Cooper in snow. It just becomes a bit more difficult to win the race when your plowing snow with your splitter/front fender, because that is how poorly the roads have been cleared. I’m writing this Saturday night, but after 43 hours from Washington-Dulles to Washington-Dulles, plus travel time to and from (perhaps magnified on the travel time from), I feel rather strongly, this was the best mileage run I’ve ever done, either alone, or with my wife. It beats the heck out of my last mileage run of 2014, as well as my wife and my mileage run to SFO. I won’t mince words. Mileage running is somewhat painful on the body, and it takes time. But if you’re going to do it. This is the way I recommend. @Chasingthepoints – It was a ton of fun too. And a day later, the only thing that hurts is my back from shoveling snow. Its definitely the way to mileage run! @Jamie — Wow – I would’ve never known! Thanks for sharing! We were quite taken aback by the question. Thanks! Although more than ready for the arctic to move on!